Halter Marine, Inc. has signed contracts for the construction of 14 supply vessels for the Marsea Marine Companies. The contracts between the New Orleans-based corporations total $53.2 million, and are believed to constitute the largest supply boat order in U.S. history. The new 180-foot vessels will be capable of carrying bulk and liquid muds, diesel fuel, drill pipe, and other supplies to offshore installations. They will also be equipped to fight off-ship fires, while their engine rooms will be protected by C02 flooding systems. The contracts call for six of the vessels to be delivered in 1981, with the remaining eight vessels to be delivered during 1982. This is in addition to a six-vessel contract package signed and delivered to Marsea Companies in 1980. 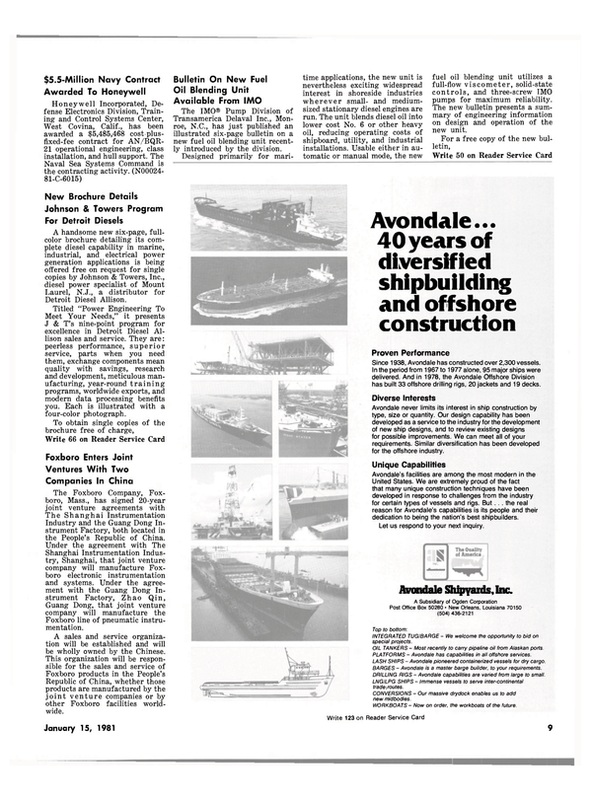 Halter Marine, Inc. is the world's largest builder of supply vessels for the offshore oil and gas industry. The company owns and operates 10 shipyards in the Southeastern United States.